Those were the days when people spoke about binary codes and other undecipherable codes like the ASCII codes. The ASCII codes are character-encoding scheme based on the English alphabets which represent text in devices such as computers, communications equipment, and other gadgets. 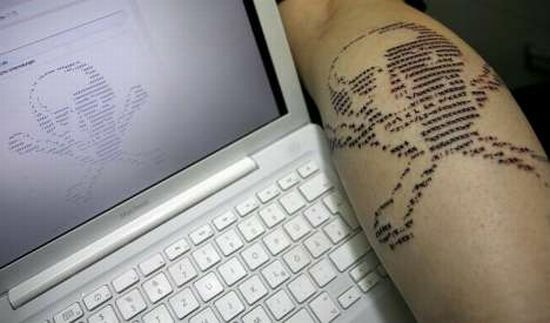 While hardly any of us know how to work with the ASCII codes, here is a tattoo artist who has gone ahead and inked a cool digital skull tattoo using the codes, thus making beautiful ASCII Art. It was created by Sabine Puchler from Burnie and pays homage to the initial days of computer texting and also the advanced levels of computing that we have reached today. It certainly must have been painful to get a tattoo like this, with all its intricacies and details. 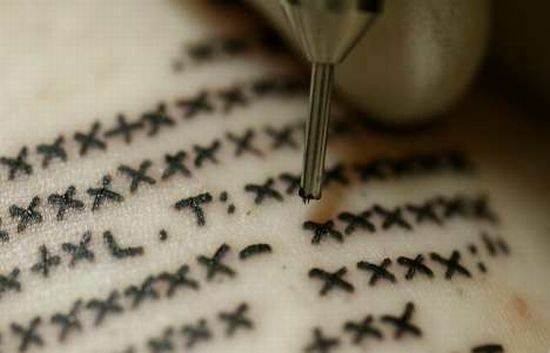 If someone asks you what ASCII codes are, now you know that they are used for texting purposes in computers and communication gadgets, and also that a certain-somebody has a skull tattoo inked with ASCII codes! You could also take a look at the 23 Geekiest Comic Book Tattoos which we had featured a few days ago. This shows that tattoo art is growing and is still in mode across the geek world.